Saturday just gone I was out in the Hutt Valley dropping off a bike to a TradeMe purchaser. It had been snowing that morning in the central Wellington streets so the air had not only a chill but a bite as well. As I came off the Petone off-ramp heading back towards the city the sun was low over the western hills. The sky to the south was black. It would be a great day to sit in the car on the south coast and wait for the storm to hit. 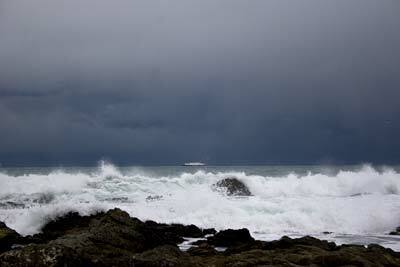 I raced home, grabbed a camera, bundled Sugar and the boys in the car and headed to Owhiro Bay to await the onslaught. Ten minutes before we got there the sun disappeared behind the approaching front. Nevermind, it still promised to be a dramatic show. We sat and waited. Number one son was fast asleep and snoring. Number two was excited to be offered a digital camera to take pictures. The sea was dead calm. The Bluebridge ferry chased the Interislander through the Wellington heads, trying to keep ahead of the impending storm. Well, after that build up you’d expect that we were lashed by gales, and thunder and lightening. Sadly, no such luck. The front approached gradually, without fanfare. In fact after 40 minutes we gave up waiting and headed back up Happy Valley. The rain started ten minutes later, big ponderous drips on the windscreen. I went to the All Blacks Springboks test match that night. Free tickets mind. I refuse to pay $150 to watch a game. We all rugged up: polyprops (top and bottom); down filled jacket; raincoat; leggings; gore-tex boots and gloves; woolly hat…I took the train in from Ngaio – a $3 return Stadium ticket. I was there in 20 minutes. Walking along Fran Wilde Walk the rain bucketed down. I waited for ten minutes for my ticket bearer, warm and dry underneath my drenched outer shell. We sat in Row Z, Aisle 2. That’s as far North as you can get in the Cake Tin, and as high as you can get in the stand without the advantage of a corporate box. We were so far from the action the big screen at the southern end showed the players at exactly life size. I had taken 10x binoculars. I provided my own closeups and commentary. The All Blacks win. Graham Henry maintains his 5 year winning streak at home – we never win the games we need to. I hop back on the train with other freezing spectators. The few South African supporters are forced to listen to the de-brief from the patriotic New Zealanders. One old man tells the carriage “The ref was blind in one eye and couldn’t see out the other”. But we won, I thought. A woman demonstrated to the strangers around her the joy of her pocket warmer. She’d gone looking for one that day, eventually tracking one down in Upper Hutt for $12. We all had a feel. It was warm. And so ended another winter night in Wellington. The announcer at the game earlier told the crowd that the Rimutaka Hill was closed due to snow. Anyone from Wairarapa would need to stay in Wellington. “Enjoy your stay” he said.